3 lenses per box @ $56.41 per box. Minimum order 2 boxes (three months' supply). 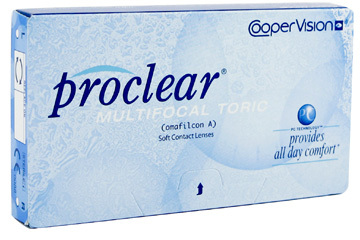 The Proclear Multifocal Toric is the only contact lens on the market which combats both astigmatism and presbyopia (a condition which makes focusing on objects and words close-up more difficult as the eye ages), making this lens an ideal choice for astigmatic lens wearers who would otherwise also require reading glasses or varifocals. Like all other Proclear lenses, the Proclear Multifocal Toric also benefits from Coopervision's PC Technology: this uses a natural material called Phosphorylcholine which keeps each lens moist and comfortable by attracting and retaining water molecules.